Quadros et al. 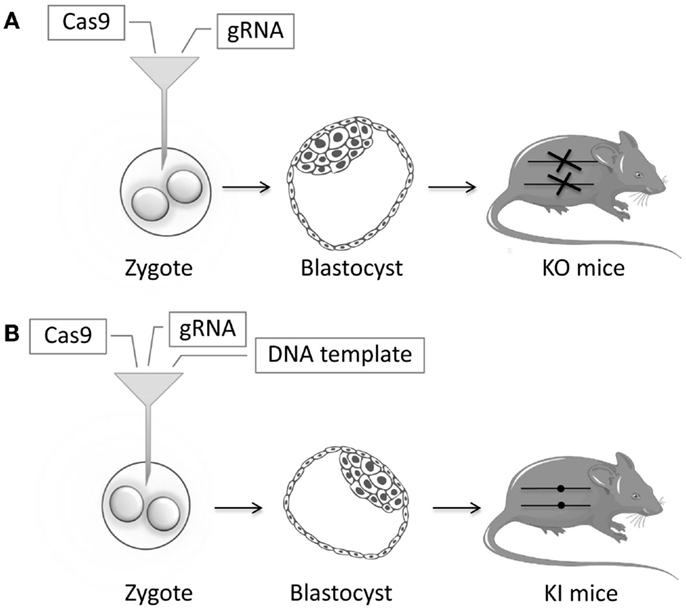 (2017) show that injecting long single stranded DNA donors and Cas9-containing ribonucleoproteins results in improved knock-in efficiency in mouse embryos and there is no reason why they would not have the same effect in insect embryos. Injecting mouse zygotes has many similarities to injecting preblastoderm insect embryos and the efficiency of obtaining knock-in alleles can be tiringly low. There is a growing body of ‘tricks’ that are aimed at improving those efficiencies. Quadros et al (2017) were particularly interested in creating ‘floxed’ exons – exons that are flanked by LoxP sites oriented in the same direction so that when recombination takes place exon excision will occur. Unfortunately, direct zygotic injections tend to be inefficient and not robust enough for routine application. This sounds like a lot of insect systems. Short single stranded DNA donor molecules (~400 bases) insert efficiently but the small size limits the types of insertions that can be made. Quadros et. al. experimented with longer single stranded donors and the use of two guide RNAs and obtained knockins along with Cas9 mRNA. These long ssDNA donors had only about 90 base on both the right and left homology arms. In this experiment they report that one of 8 progeny carried the floxed allele. I seems generally true that preloaded Cas9/gRNA ribonucleoprotein complexes are more effective than Cas9 mRNA and Cas9-containing plasmids that must be transiently expression. When they used preloaded Cas9/gRNA ribonucleoprotein particles along with long ssDNA donors. Of the 10 resulting animals 2 had no insertions, four had partial insertions (of a single lox site) and four were bona finde floxed alleles. This result is not a special case due to the something unique about the first target gene because the authors applied the strategy to 6 other different loci. Efficiencies varied from 8.5 to 100%. So seven genes were targeted and a total of 46 G0 pups were genotyped with 20 that contained correctly floxed alleles. The authors’ approach was not just applicable to the insertion of Lox-flanked exons but also marker genes, recombinase gene among others. Single stranded donors ranged in length from 0.8 to 1.4 kb. In all cases high efficiency knock-in mutations were observed – from 25-67% in the G0 stage. When crossed with wild-type mice knock-in progeny were recovered from 9 of the 13 targeting experiments. Long single stranded DNA donor molecules seem to make a big difference and their impact on the efficacy of insect knock-in experiments should be explored, although it seems like the results of Quadros et al. should be generally true. Quadros RM, Miura H, et al. (2017) Easi-CRISPR: a robust method for one-step generation of mice carrying conditional and insertion alleles using long ssDNA donors and CRISPR ribonucleoproteins. Genome Biol, DOI 10.1186/s13059-017-1220-4.